A great city is one whose image dwells in the memory man. When we look to iconic cities such as New York, Hong Kong, London, Paris or Shanghai, we remember them for their distinctive skylines and architecture. We also carry romantic images of their great legacies in science, faith, commerce, philosophy and art. 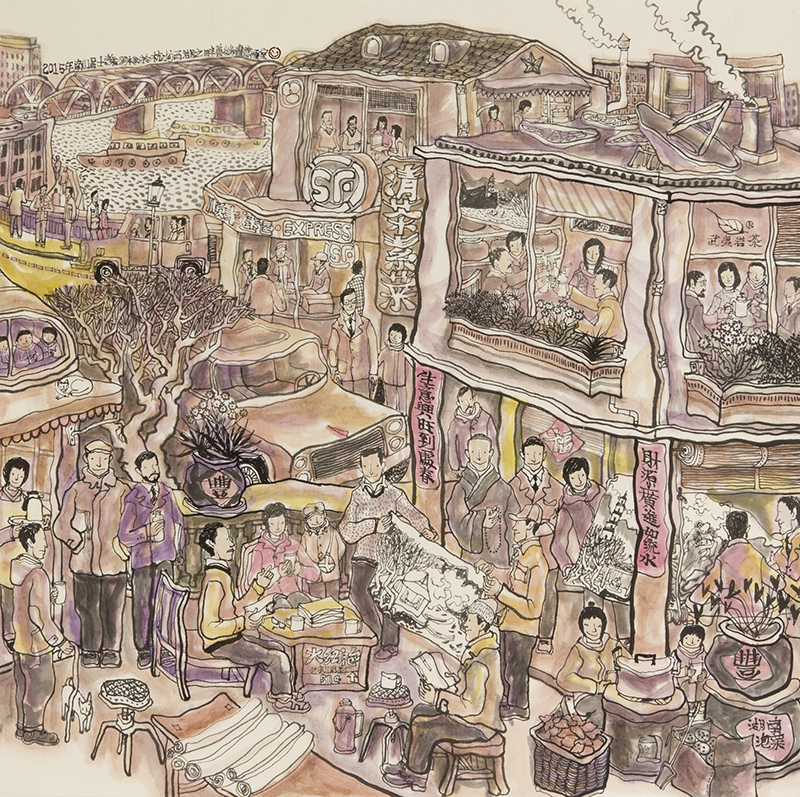 Xie Chong’s Paradise series however are about a different type of great city whose image springs from an ingenuous soul. 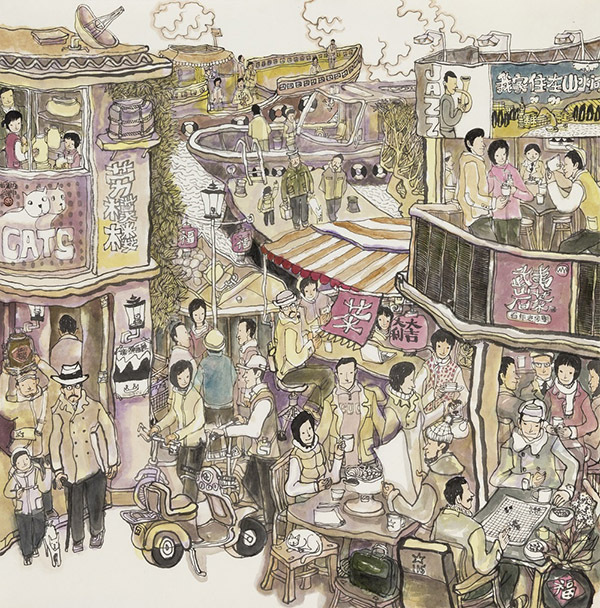 Xie Chong’s city scenes are not about the manic bustling energy of a modern metropolis, but a throwback to the quieter urban world that many may remember from their youth. It is a heartwarming city of connected people, not the caffeine-infused frenzy of the iPhone generation. 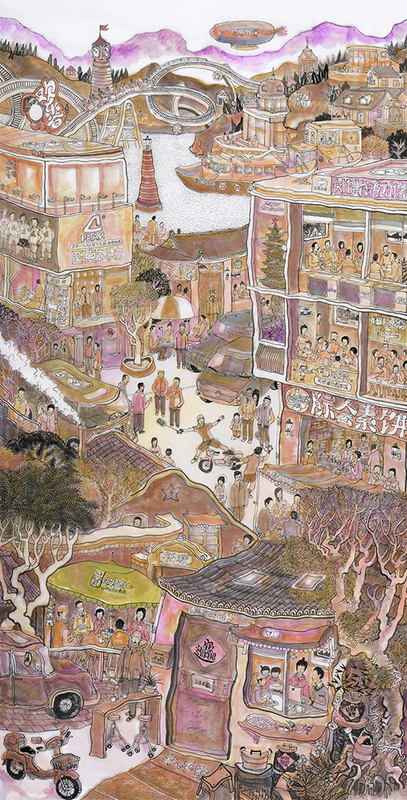 Xie Chong’s cities are populated by people who understand a very different pace of life. The tranquil scenes are of unhurried people savoring the simple joys of life. Plato once said of Athens ‘This City is what it is because our citizens are what they are’. 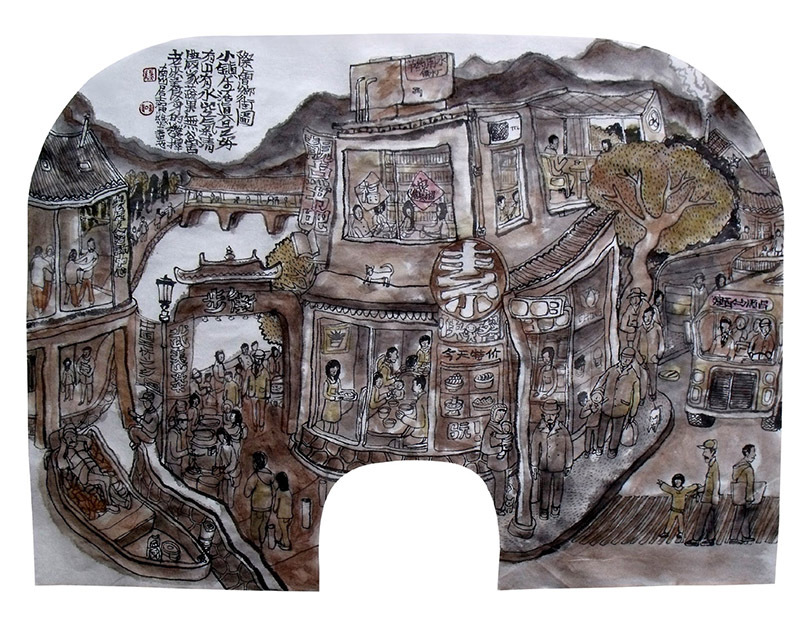 Xie Chong’s cities do not contain inspiring monuments or famous buildings, but its carefree citizens create their own memorable city of peace and joy. His is a city of the heart that taps on the universal yearning for simplicity and harmony. 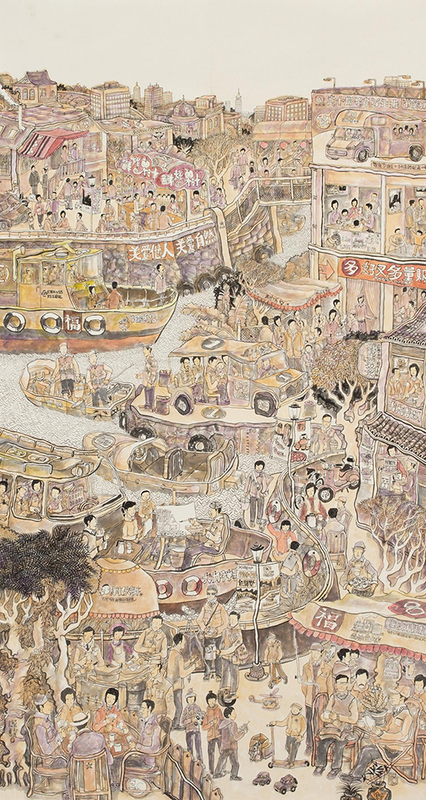 Xie Chong’s paintings reflect his personal philosophy about living a meaningful life. While working and making a living to sustain our needs is inevitable, we often neglect our spiritual needs. We often lose sight of the fact that we have options in life, and unique gifts that frequently lie dormant and unexplored. 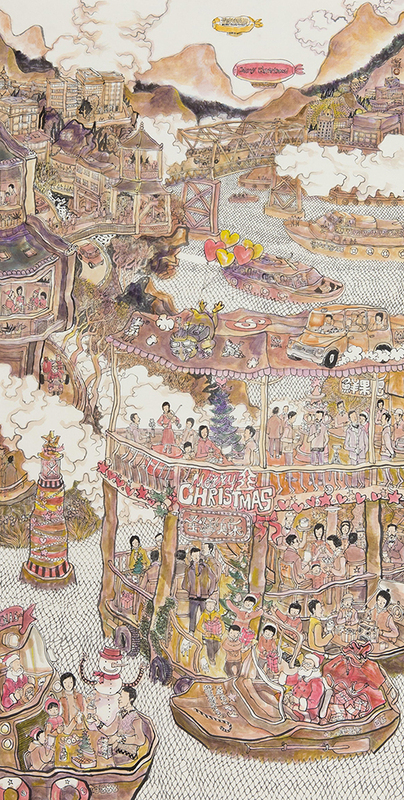 Xie Chong’s art is about a quieter, gentler world where people are connected and life is about slowing down for what is important – friends, family and spirituality. 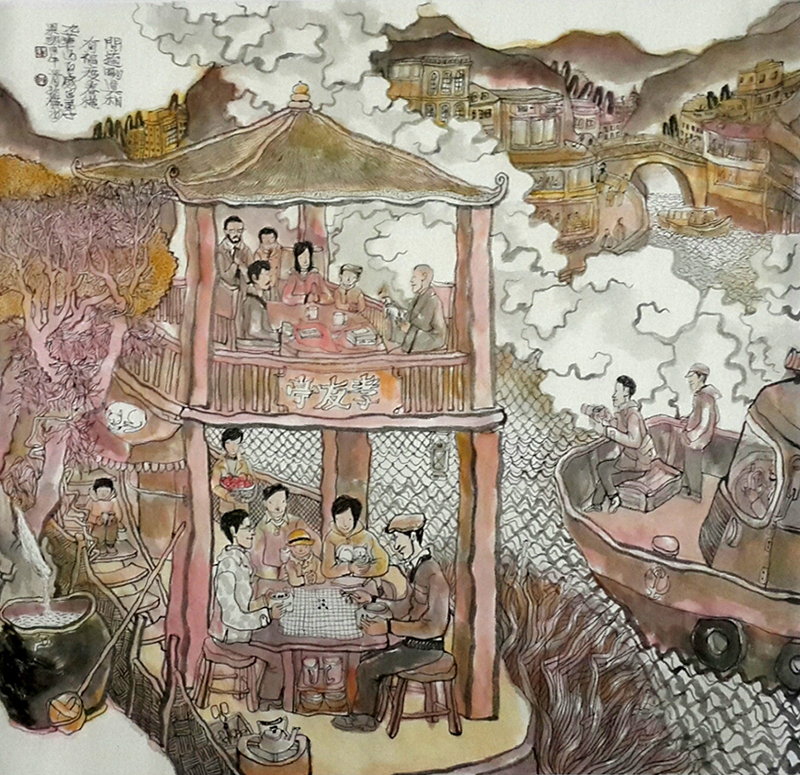 His tranquil scenes are of unhurried people savouring the simple joys of life. Some of the common motifs that populates his paintings are of people sharing a meal, friends gathering for tea, an artist working on his easel or people celebrating a festival. They all have in common people taking time away to be with each other. Xie Chong little universes exude a calm, positive energy that comes from the quiet of the inner soul. The artist believes that we should be able to find serenity and balance in the big city that we live in; if we are unable to find our inner equilibrium in our immediate urban world, seeking quietude in a distant quiet mountain retreat is only a temporary relief. After graduating from Xiamen University’s art academy, Xie Chong worked as an animation illustrator on projects for Disney as well as various Japanese studios. This experience has served him well and has been an important source of influence for his art. His time as an animation illustrator has made him a very confident painter – his complex compositions are done without sketches. 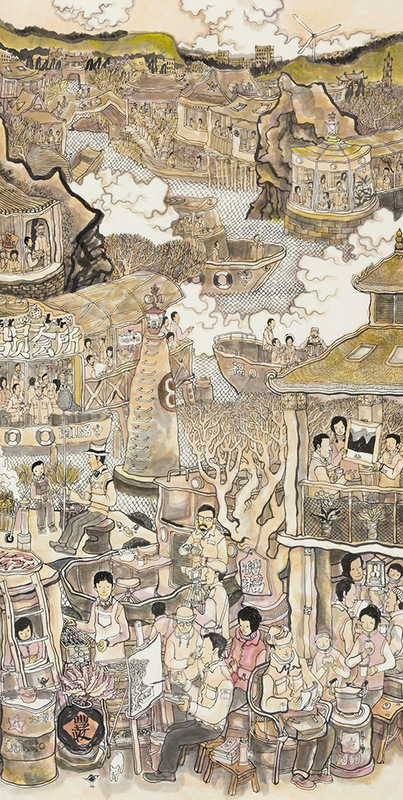 He starts from the bottom of the painting and works his way to the top, entirely with just his ink brush. 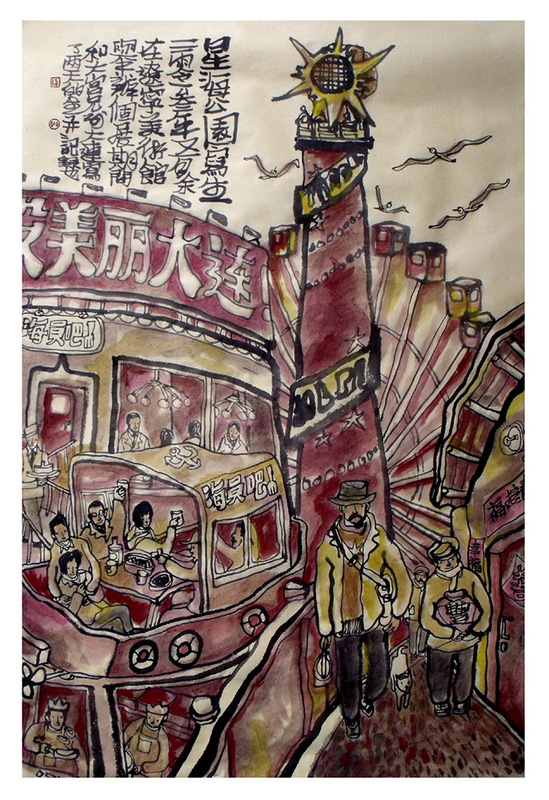 Due to this ‘unplanned’ approach, his brushstrokes have the uninhibited and unconstrained free form feel of traditional Chinese ink painting. His studio is often littered with half-completed works; because he does not start with a sketch, he sometimes reaches an impasse when painting and will decide not to continue the painting. 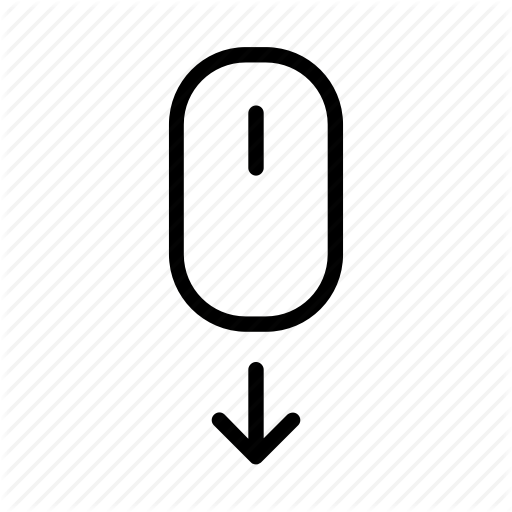 In the past, the artist used to take certain portions of the discarded painting as a reference for the new painting, copying the parts that he was satisfied with. However, he found that there was a discrepancy in style and feel between the ‘copied’ and the freshly composed portions of the painting. The former felt deliberate and stiff, and the combination resulted in a Frankenstein creation. He has since made a deliberate effort to dispose of failed pieces and to avoid their influence on his new works. In animation illustration, it is important to focus on the story and not just the art. 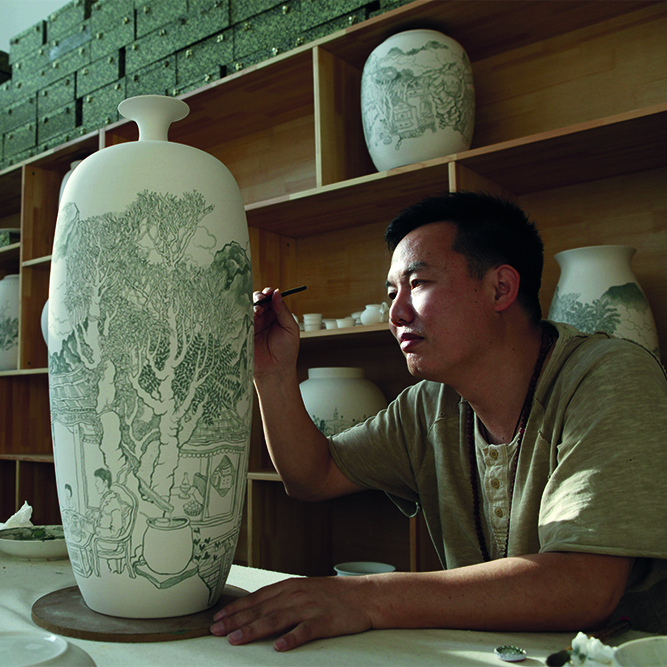 This storytelling is another aspect of Xie Chong’s early animation experience that has been brought over to his art. His scenes tell a multitude of stories which rewards the careful observer. Xie Chong spends most of his time on the road. 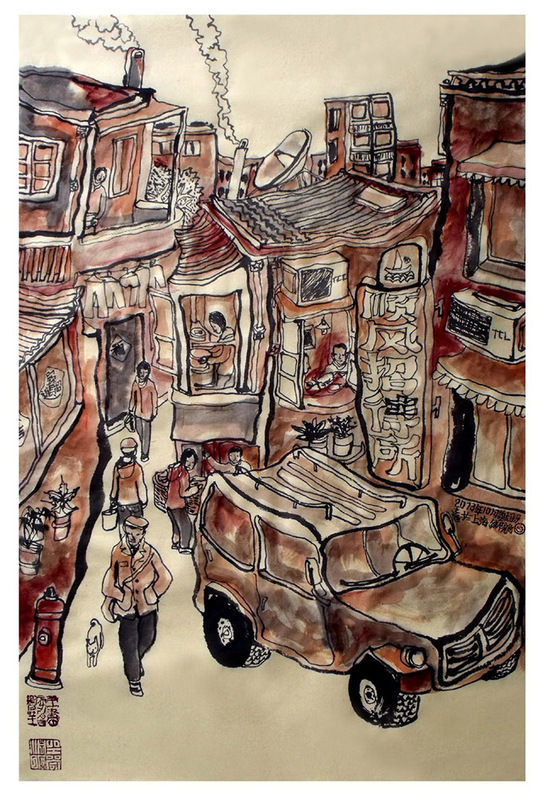 He is constantly researching and visiting small towns and cities across China where rapid development and modernization have not completely changed the cityscape and the people. 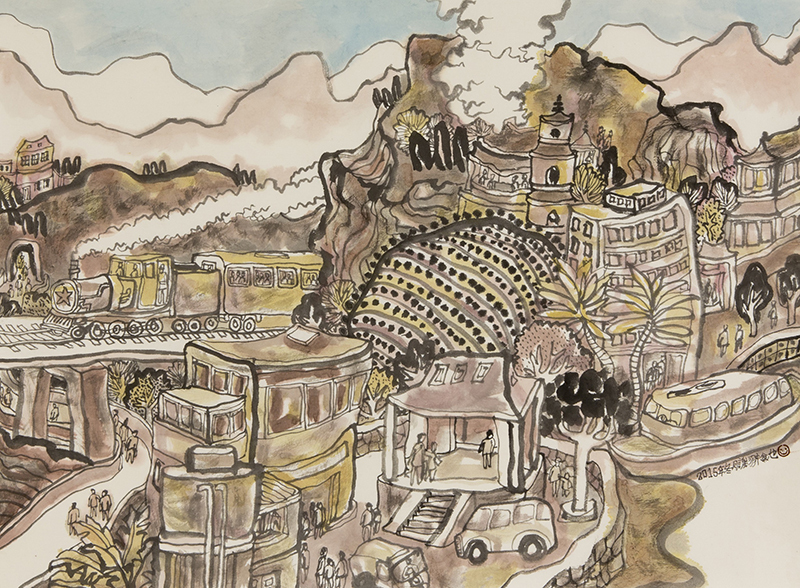 He visits these quieter cities and towns to draw inspiration from the scenes. 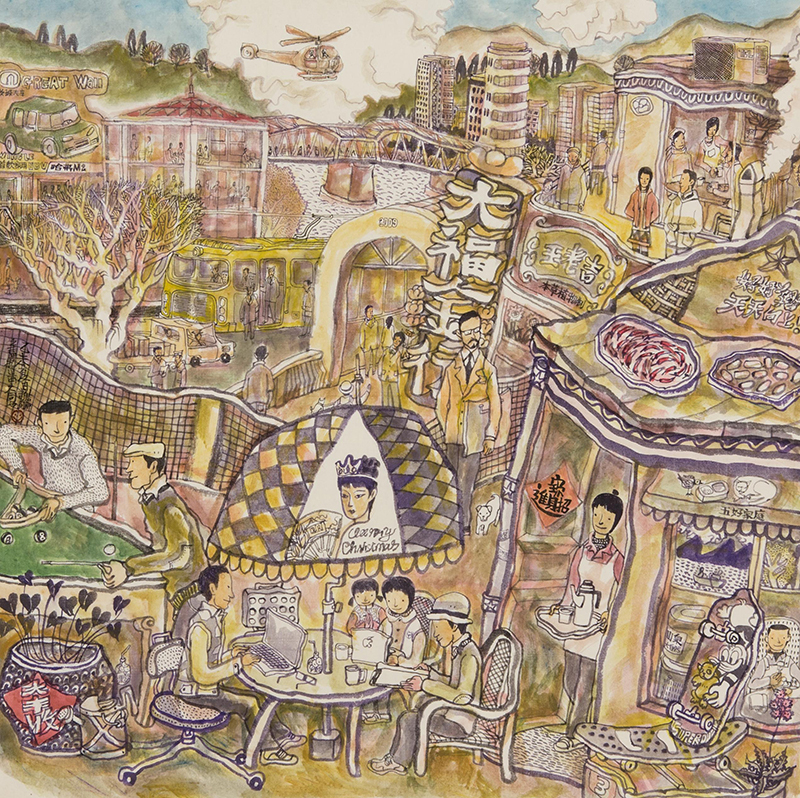 Xie Chong will sometimes paint his smaller city scenes plein air, but in the grand tradition of Chinese landscape artists, his intent in travelling to many different locations is so that he has seen and experienced the world, and what he paints in his studio is his experience rather than a nature study of a specific scene. This is fundamentally the difference between the Western concept of scenery painting and the Chinese ‘Shanshui’ landscape painting. 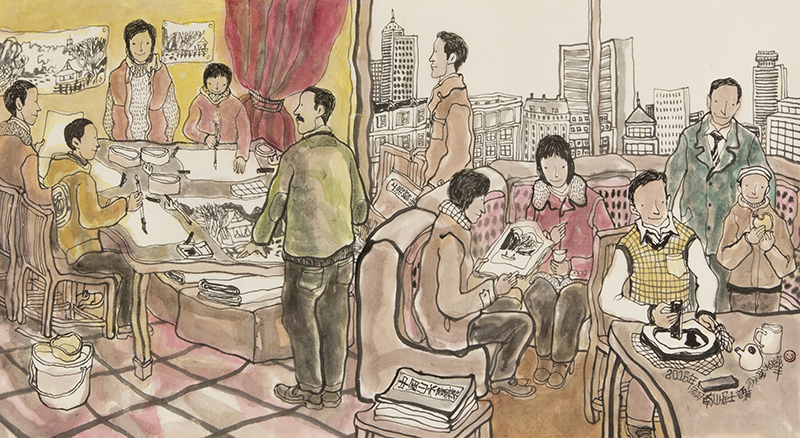 Xie Chong grew up in a military commune where his parents worked in a township that was primarily for the needs of the members of a military unit and their dependents. It was a small town and incredibly compact – more than twenty thousand people in a small space of living in a tiny space of a square kilometer. He grew up in this microcosm of an urban jungle. Everything happened in close proximity - school, games and family celebrations. This has been an important influence in his paintings. In many of his paintings, you can see the writing of the artist – usually this describes his mood at the moment while painting (oftentimes it includes some philosophical musing about life), as well as the location he is painting at. 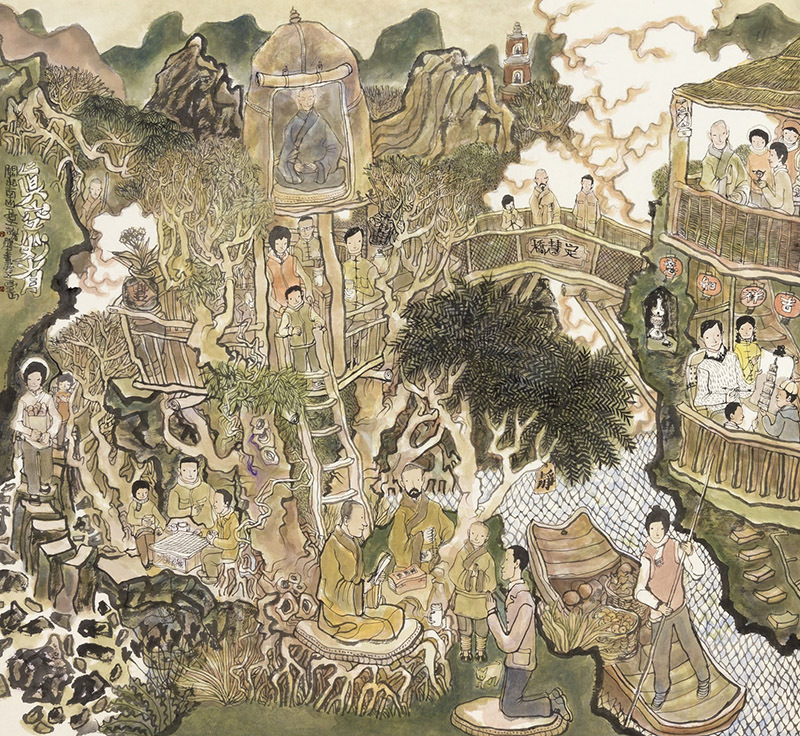 For his larger compositions, the paintings are made up of many little scenes he observes in his travels. 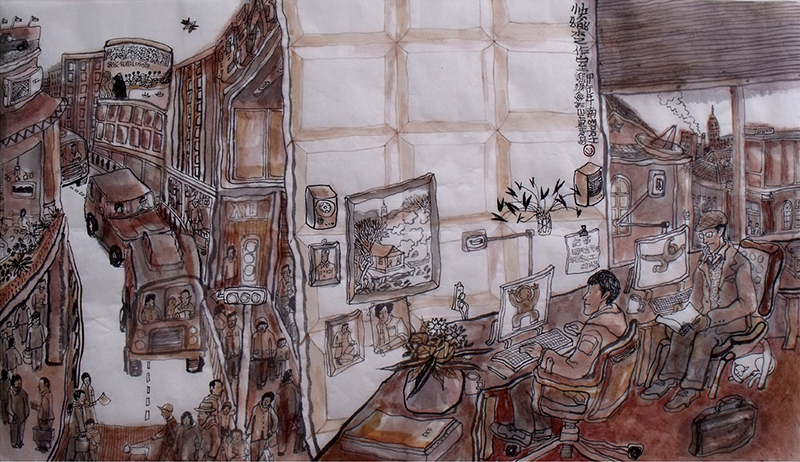 The time the artist takes to travel, observe and sketch is one of the key reasons why his pieces do not appear repetitive – each piece is from direct personal experience. 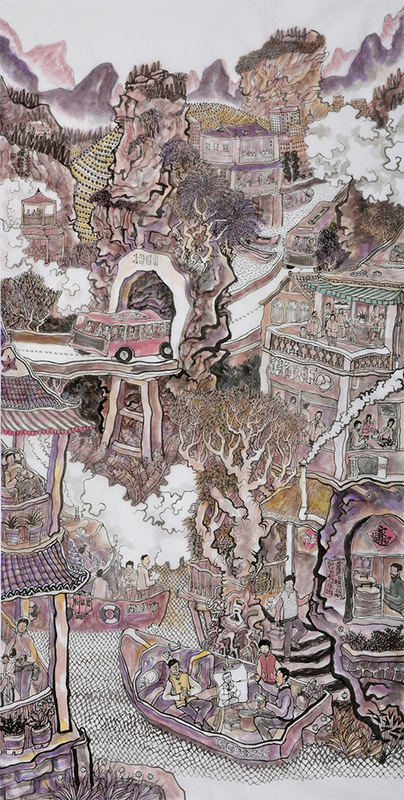 Xie Chong’s urban settings carry a message of balance and living in ecological harmony with nature. In his travels he sees more clearly than most people the contrast between the rapid urbanization, pollution and sprawl of the fast developing cities, and the dwindling numbers of quiet small towns. In his paintings, nature, the city and people co-exist in symbiosis. Instead of massive six-lane highways, people stroll on pedestrian walkways or boats meander slowly down the river. 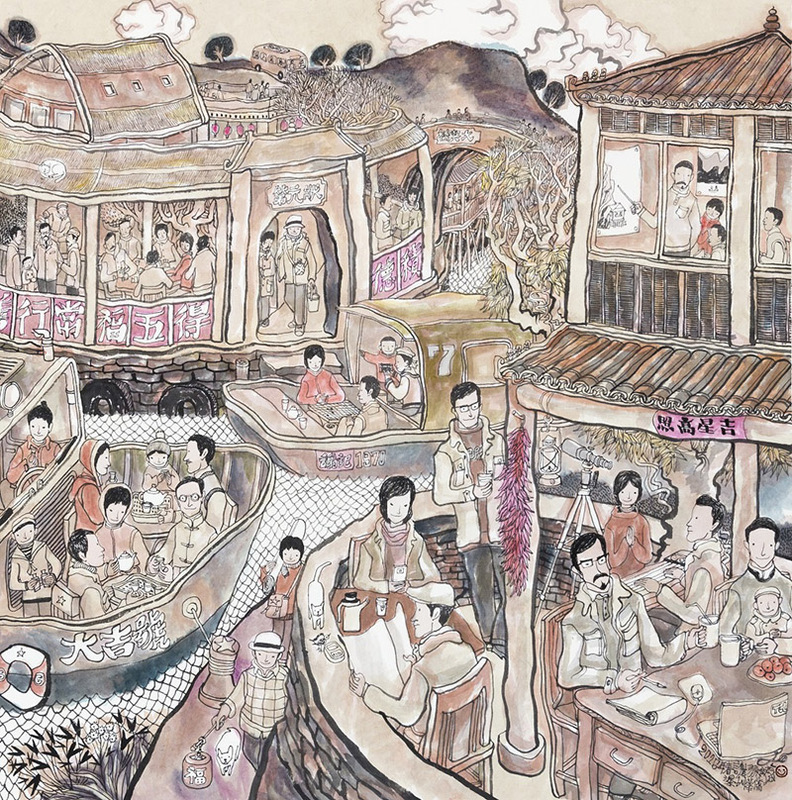 Each painting that Xie Chong creates is personal to the artist because it is a memory of his travels and of a scene that inspired him. In some of his paintings, he writes about the location and the scene he has captured, and he frequently includes philosophical musings. 2015	Liaoning Museum of Fine Arts acquired Full of Joy and Bottomless Sea.